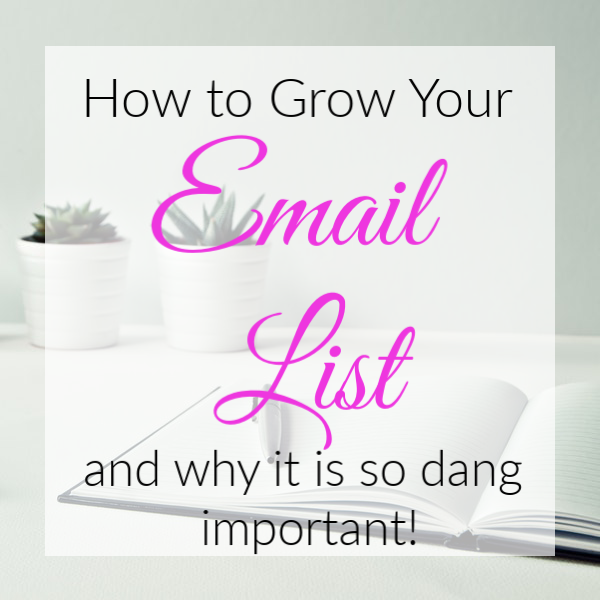 How to Grow Your Email List and Why it is So Dang Important! 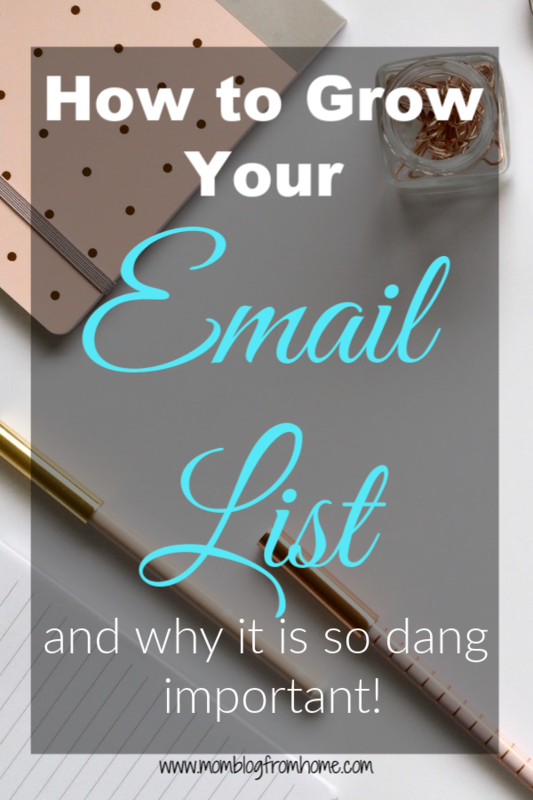 Have you ever wondered what the big deal is with having an email list as a blogger? I always read that it was such a big deal but I didn’t fully understand why. Now I get it! 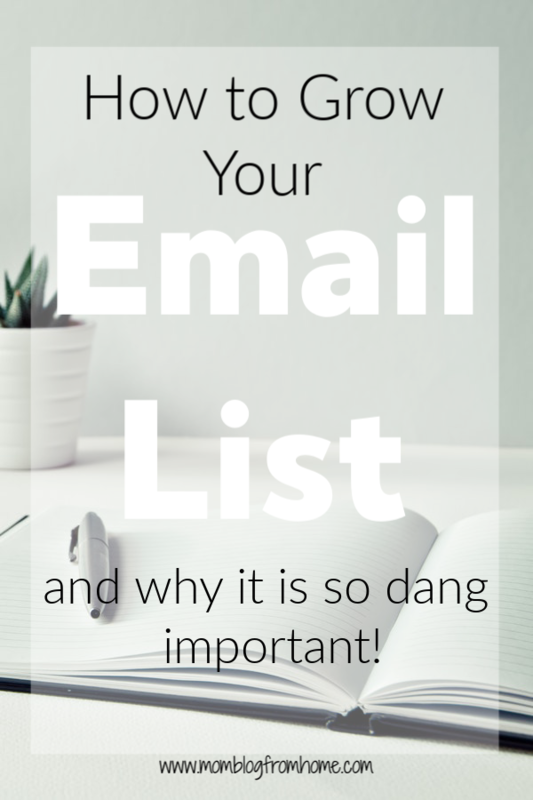 Having and growing an email list is your way of keeping in touch with your followers! It is like having a secret mailbox to send them information about your blog. You want to stay in touch with the people that come to your blog. You don’t want them to just stop by and then forget about you! A great way to gain email subscribers is to offer a freebie for them to sign up for. People are more likely to sign up when they are going to receive something. Also, this is a great way to give value and share with your readers so they see you are worth coming back for more. Not only does it add value but it also hooks your readers. They can learn just enough from your freebie to feel they got something of worth but then they will see you are knowledgeable and want to learn more! Imagine going out door to door trying to advertise your business. You meet people, talk about your business, and then leave them with a business card and a sample. Let’s say you sell vitamins and you leave them with a sample (a freebie) they are more than willing to take that sample even if they don’t use it. People love free stuff! You have now made a connection and introduced yourself and your product. But now the ball is in their court. For them to become a returning customer they would have to call you. They have your business card so now it’s a waiting game. Your card most likely will end up in the trash can and unless your product was super amazing the odds of them becoming a customer are very slim. But if you followed up with them again and asked how they liked the product and maybe even offer them some more free samples then you are getting closer to them become a customer! Now obviously you can’t go door to door trying to sell your product and then be able to return to those same potential customers to follow up with them. However, if you got their email address you would be able to pop up in their inbox easily! This increases the chances of them becoming a true customer! Now I hope you can see that I was using that as an example of how if someone comes to your blog and gets a freebie on “The Best Vitamins to Take After the Age of 30” then you could easily follow up with them and see if they enjoyed the list, if they have tried them before, why they are looking for supplementation, etc! You now have their email address and you can pop in weekly and refresh their brain on how much they enjoyed your freebie and how they want to learn more. 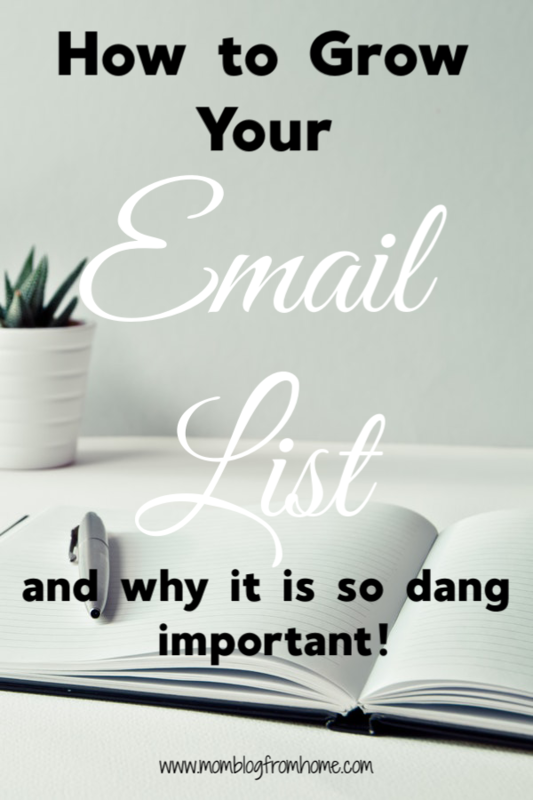 Having a list of email addresses that you can email weekly while still building your list and reaching new people is amazing! Your potential customer list is growing and you are able to follow up and cater to them! Once you have established a good relationship with your readers you now have gained their trust and they have become loyal followers. Not just someone who stumbled across your blog but a loyal follower who looks forward to your next email. Then when you have a paid product you are ready to introduce to them they are ready to buy from you. They trust you. You have established a good foundation and relationship with them by providing helpful and useful information every week. They know that whatever product you are sharing must be good! Your loyal followers turn into loyal customers. Customers who will also in the future look forward to what you have to offer! All because you got their email address and you were able to nurture that relationship. 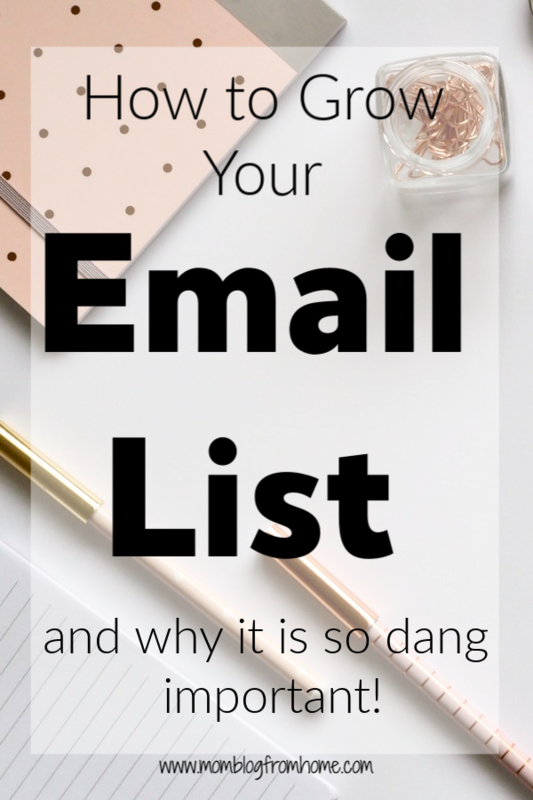 I have had bloggers tell me that 50% or more of their sales come from their email list. 50%! That is amazing! So what is a good freebie? A freebie is something you will offer your readers in exchange for their email address. It won’t feel like you are trading to them. It will feel like you are friends helping each other out. If you put “If you give me your email address, I’ll send you this free printable” no one is going to sign up. That just sounds like a scam. If you put “Hey friends I made this awesome printable. I’d love to send you a free copy!” They won’t think twice about entering their email address to get that free printable! So what makes a good freebie? You want to offer them something of value. It needs to help solve a problem for them. It could look super cool but if it is about “The Best Ways to Train Your Goldfish” then I’m out. I don’t need that. There is no value in that for me personally. Now if your blog is about training goldfish then sure! If your blog is about makeup then you could offer “The Top 5 Makeup Brushes to Use in 2018”. That would be helpful for someone who has no idea what makeup brush to use. You could even go a little further and explain what the brushes are used for. For someone like me, I couldn’t tell you anything about makeup brushes so if I was trying to get into it I wouldn’t even know what brush was for what purpose! This would solve a problem for me. It would be a great freebie! Make sure that your freebie pertains to your blog niche and that your freebie isn’t too broad either. If you blog is about gluten-free foods then a freebie that would be great is “Top 5 Gluten Free Recipes For Muffins”. It is within your blog niche but niched down just a little more to a more specific need. I don’t watch for gluten-free recipes but I do know a few friends that I could see downloading that freebie for sure! You don’t want your freebie to be too broad. For example: “100 Gluten Free Recipes”. There might be some that would jump on that but to me, that seems too overwhelming. I don’t want to read all that. That isn’t something I could quickly print off. That might be something I would pin for later but I don’t think I would give my email address for something so broad. Where do you put your freebies? 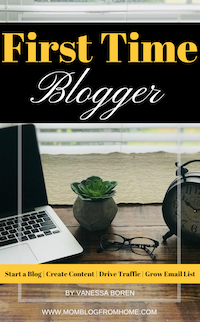 There are several places you can put your freebies on your blog. But each blog post should contain one freebie for sure. Your goal with writing each post is to get your readers to read it by helping them with a problem and then turn them into loyal readers. Reading one blog post probably won’t make them loyal readers. However, getting their email address through that blog post will help turn them into loyal readers. How? Like I said before, now you can reach them weekly and keep reminding them of how awesome you are! Then when they read your email and get more great information they will look forward to your new blog posts and emails! 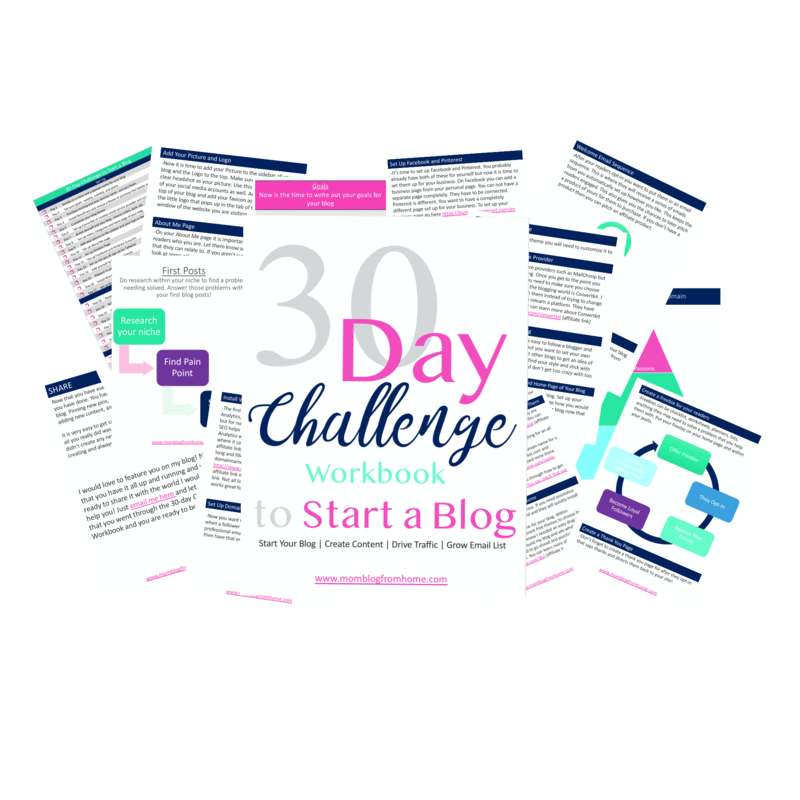 You can put your freebie right in the middle of your blog post, at the beginning, at the end, or have it as a pop-up, really the option is up to you! It depends on what your freebie is on where you would feel it should go. If in the middle of your blog post is where you are talking about that freebie then that might be a good place to put it! If your freebie is broader and doesn’t specifically fit into that blog post but you can remind them about it at the end of the post then that’s where you should put it! Maybe you can’t come up with a freebie that fits anywhere in your blog post then you could have the option to have a pop up to a popular opt-in that does well on your blog. Then it wouldn’t matter so much if it doesn’t pertain directly to that post. What should my freebie be? This is similar to the reason you are writing the post in the first place. You want to solve a problem for your readers. With a freebie, you want to help them along the way of solving their problem. If your goal is to teach them the best workouts to do to lose that belly fat then your freebie could be an easy printout with the steps on it. It could be a checklist so as they do those exercises every day they can check it off! The best freebies can be checklists, calendars, resources, free mini-course, etc! Here are two freebies that I offer to my readers that do well. One is a guide and one is a mini-course. Once you have them signed up for your opt-in and on your email list you can now nurture and grow that relationship. How do you make a freebie? I use PicMonkey to create all of my freebie and Pinterest images. 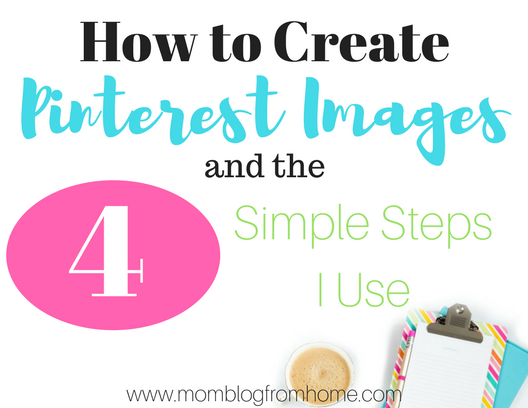 You can check out How I do them in my How to Create Pinterest Images Course listed above! Depending on what email service provider you use can make a difference too. For example, I use Convertkit. It is a paid service but it is worth it to me because they are one of the best! I love their live chat option that you can use to ask quick questions. The reps are always so nice and helpful. They have tutorials and videos to walk you through step by step on setting things up. They are on top of their game when new regulations change such as the GDPR. And so many other wonderful things. But I will tell you why I love them the most. It is their easy to use system that integrates with so many other services out there. Let’s say that you have a new course on Teachable that you want to offer to a certain group on your email list. Convertkit and Teachable integrate and work together. 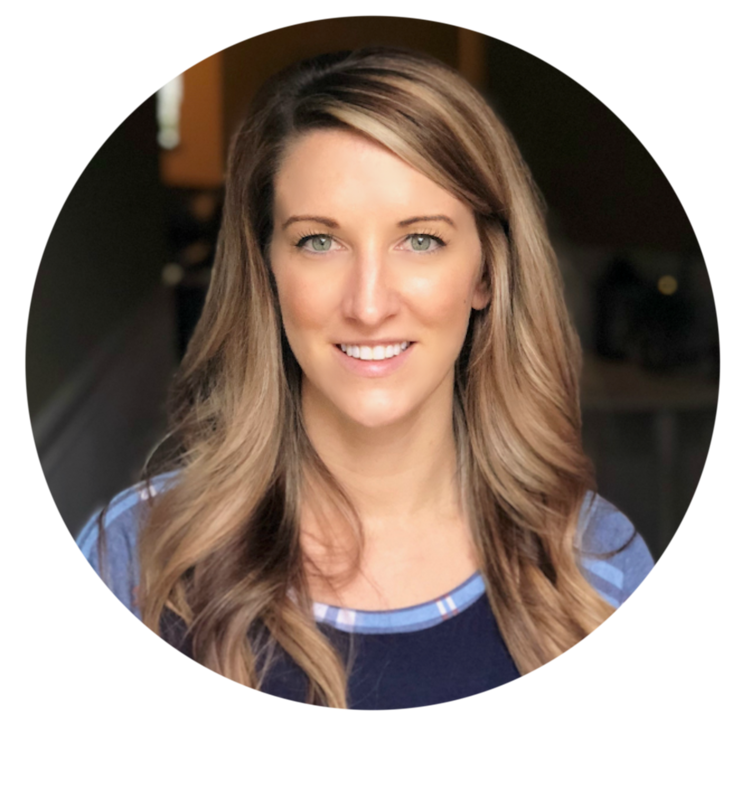 You can then send out an email to your certain group of people (that you can separate using tags within Convertkit) and then after someone signs up for your course Teachable will communicate with Convertkit letting them know. So then when you follow up with that same group in a few days to see if they had time to sign up or missed your email or whatever you don’t want to send that email to the ones that already signed up right? No, so you can tell Convertkit to send it to that same group that hasn’t signed up yet. That is pretty specific! You can add tags, segments, automations, email sequences, and so much more within Convertkit! This makes email marketing fun! 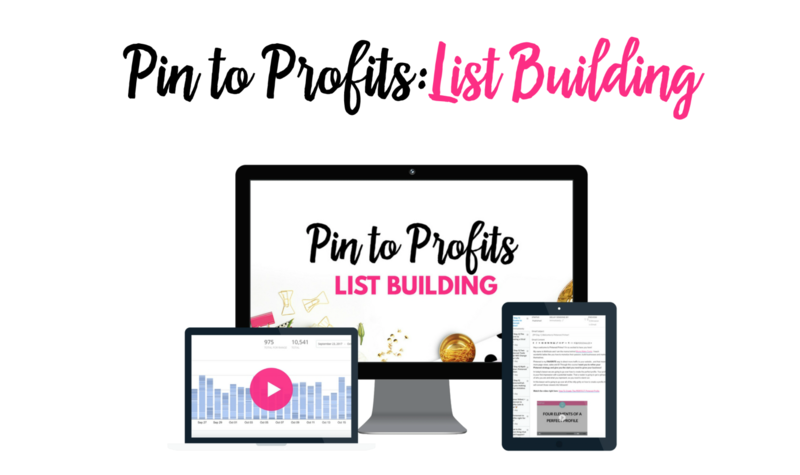 When you can have your list organized so when you need to talk to just a certain group of our list you can narrow it down and target just that group! 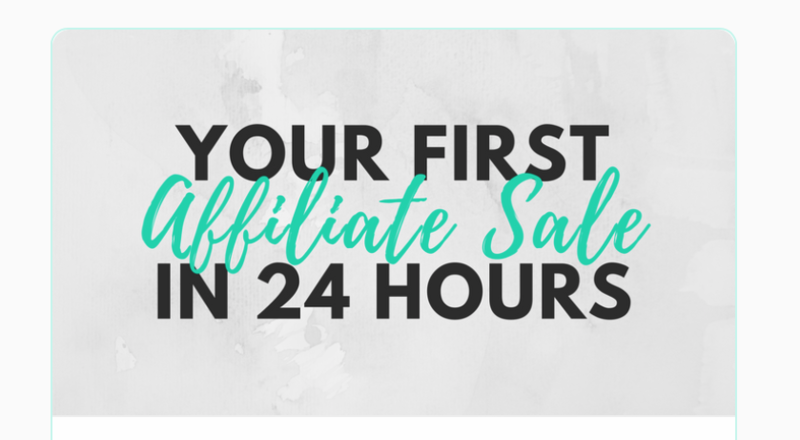 If you want to try Convertkit out then grab your first month free right here! You may be wondering but why Convertkit? There are other companies out there too. Well, this is why I chose Convertkit. They offer a live chat to help walk you through any questions you may have. If they live chat is down then you can send them a quick email and you will get a speedy response! This is awesome for me because I like to know the answer now. No one likes to wait. Plus, that may the only time you have to work on something and you don’t want to be stuck on one little hiccup. They integrate with so many other services like WordPress, Shopify, Teachable, Woo-Commerce and more! You can have a bird’s eye view of you automations. This shows you your funnel in an easy to understand view. You can see that once your reader finishes this email sequence they will then go into this email sequence. Or maybe you have a trigger that says they purchased a product so then they go into a different sequence. You can set rules up so that you can guide your readers where you want them to go. This will ensure they are getting the best service from you. So, if your readers click on a link you can have that triggered to add a tag to them so you know they are interested in whatever that link was. This just helps tailor and customize each reader’s experience with you. Just like I said before you can have something trigger to add a tag or add that reader to a segment. The possibilities are pretty much endless! Convertkit provides so many different stats! You can filter it down to whichever detail you want! It is very awesome! Convertkit offers landing pages. You can choose to have your opt-in be a form or a landing page and then it gives you more details from there. It is great how you can customize your opt-in to get exactly what you are looking for! It, of course, has a WordPress plugin. This makes it nice to be able to easily add an opt-in at the bottom of your post or again change your how page into a landing page. As I stated before you can tag your readers so you get to find out more about them. If they click on a link in your email that is for learning how to write an ebook then you know that is something they are interested in. So later if you have more information on how to write an ebook then you can send it to those who clicked that link and were tagged with saying they liked that information. Segments let you organize your tags, sequences, and forms like a folder. This has been great for me since I am not the most tech savvy person. I like going on and getting a quick video walkthrough on how to do something. This could save me a bunch of time but watching someone walk me through how to do it. Many of the bigger bloggers I follow use Convertkit. This helped to give them credibility. I knew it must be a good service and company for them to trust Convertkit. That was the main selling point for me. I knew if I wanted to be successful like them I need to do what successful people do (and use!). Do you already have an email service provider? Who do you use? And do you like them?